The name Nike is inspired by the name of the Greek Goddess of Victory - NIKE. 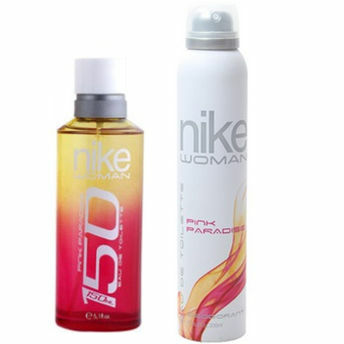 Nike N150 Pink Paradise For Women is ideal for vibrant and dynamic women of today.The active deodorant formula gives continuous effective protection against perspiration odors during the whole day. Spray it on and feel like a Greek Goddess. Nike 150 Pink Paradise Gift Set (EDT 150ml + Deo 200ml) is an ideal gift for the confident modern woman.